IORI KOLAR is a certified dancer and an instructor of Japanese Traditional Dance of the school of Yoshimura. Her dance classes are offered at her home studio in Iwakura, Kyoto. 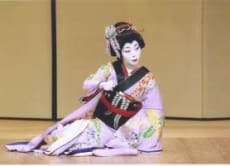 She has performed dances in various occasions including theaters of Tokyo, Osaka, Kyoto, and in Seattle, WA. She also has a master's degree in Art Leadership from the Seattle University, and a certificate of graduate studies in Expressive Arts from the European Graduate School in Switzerland. Very nice lesson, Lori knows how to build up the lesson very well and creates a nice atmosphere. I learned a lot in a short time and it was a very nice experience too! I would highly recommend dancers to take this lesson to learn about the Japanese dance. I can really recommend this class! The host Shizu is so kind and a good teacher. You get to wear a kimono and its possible to make videos and take photos. One of my best experiences during my stay in Japan. Five stars!!! Thank you Shizu, for the great experience. It was a wonderful experience. Lori is a great teacher and she demonstrated and explained every movement clearly. I highly recommand this activity to someone who are interested in Japanese culture and traditional dancing! Very nice experience!! Lory is very kindly and great gest!! Very recommended! !